Bill Hillmann, who wrote a book on surviving the Running of the Bulls, was gored during the event. Even under the most controlled of circumstances, bulls are dangerous. In Spain, where bull fighting is still a revered sport in most locations where it isn’t banned and matadors are still something of a heroic figure when they don’t poop their pants running away from the bull, the bull is both a figure of sport and a figure of regional pride. Witness, if you will, the historic and insane Running of the Bulls, in which bulls are released into the streets of Pamplona, Spain, for hundreds of people to flee from in a mad dash for survival. 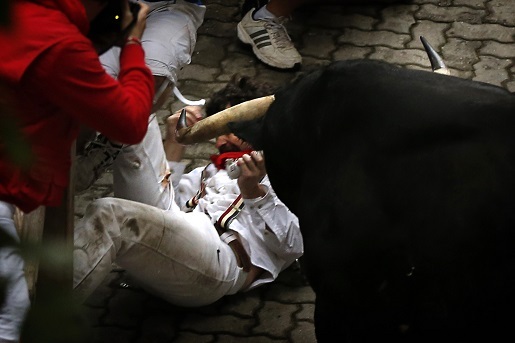 Bill Hillmann, the author of Fiesta: How To Survive The Bulls of Pamplona, has been gored by the bulls of Pamplona. To his credit, he did survive, so perhaps his book does have some good lessons for potential runners? The other person gored on the third day of the nine-day street festival, a 35-year-old Spaniard, was seriously injured. Apparently, the bull got separated from the pack and turned on the people around it, goring Hillmann to the ground in the process. He suffered two goring injuries to his right thigh and is expected to make a recovery. The book’s co-author, Brit Alexander Fiske-Harrison, has been running alongside Hillmann and has yet to be injured in the festival.